I spent a fabulous fall Friday at Lettre Sauvage which focuses on letterpress stationary, broadsides, and chapbooks (they of the chapbook competition which closes Nov. 1– go here for info). Before we settled down to the business of making my business cards and stationary, Fiona showed my friend Dave and I and the small boy around the two shops and old machinery, pieces of type in various fonts, blocks with art ready for printing, miscellaneous samples, and miscellaneous marvels. I love fonts, and paper, and color, and graphic images, so I was in love with everything making it a bit of a challenge to find my way to some decisions. Certain ideas came through and I settled on a color combination of chartreuse green and cobalt blue to represent earth and sky or land and water. For a graphic, I decided on a jimson weed or datura (more info here and here) which is native locally, to pictorially represent my “greenness” and “nativeness” and possibly even a shamanistic or magic quality (with words anyway!) since the local Chumash used datura for visions. The plant is a yellowish green similar to chartreuse and has a large usually creamy white purpe tinged flower with a wonderful scent that flows out as the blooms open and unwind as the sun goes down. It’s common along roadsides and washes, preferring to grow in land that’s been disturbed. I chose the deep purplish cobalt blue for the text below. The other side of the card includes my address and other info and sports an image of a circus acrobat–which I liked because as a writer I want to be playful but it is also a serious and risky business to fly through the air. For the font, we chose Goudy regular and italic because it is classic, beautiful, and they had the sizes I wanted for my design. 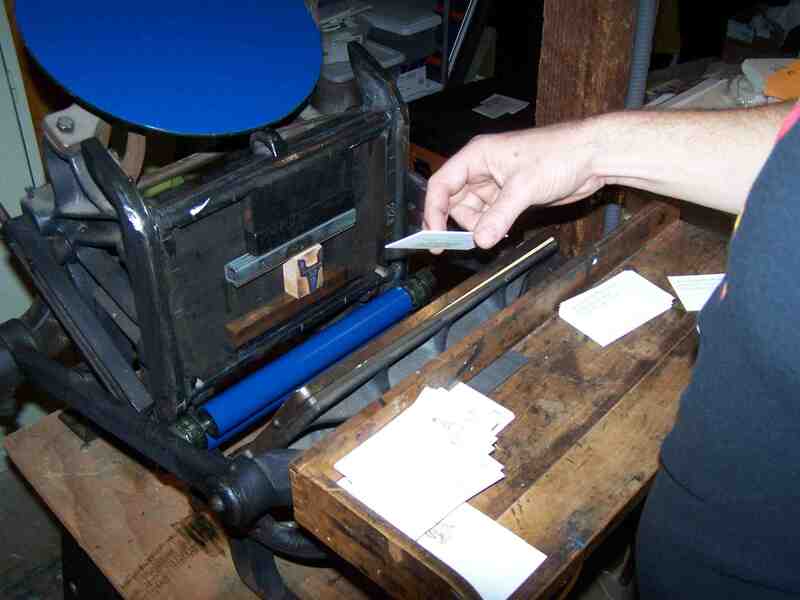 We had to run each of the 300 cards through the press four times–one time on each side for the images and one time on each side for the text: ink, slide the paper in the slot, pull the lever down, click, then back up, repeat. 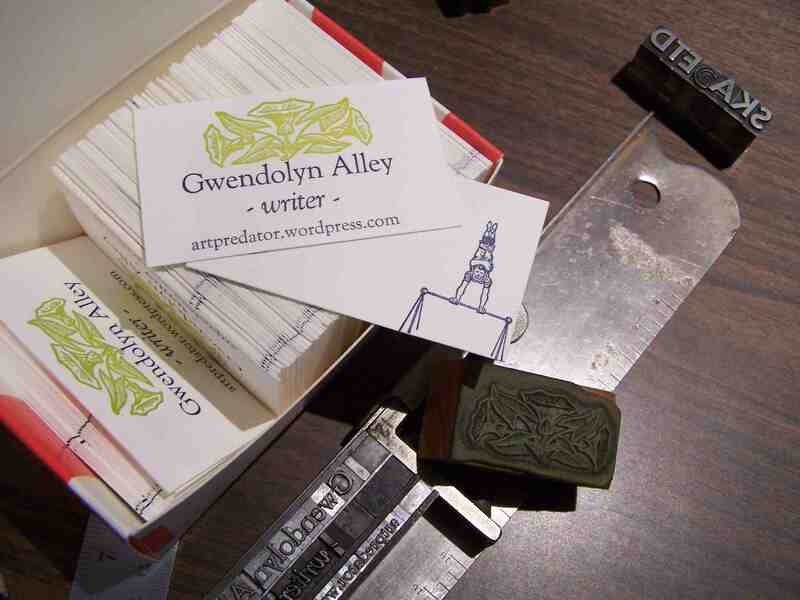 For most of the cards, my friend Dave helped me run the press while Fiona set the type. We did the green image, then Fiona cleaned and reinked in blue. Fiona’s husband Cameron guided us and directed us and even did some of the printing. 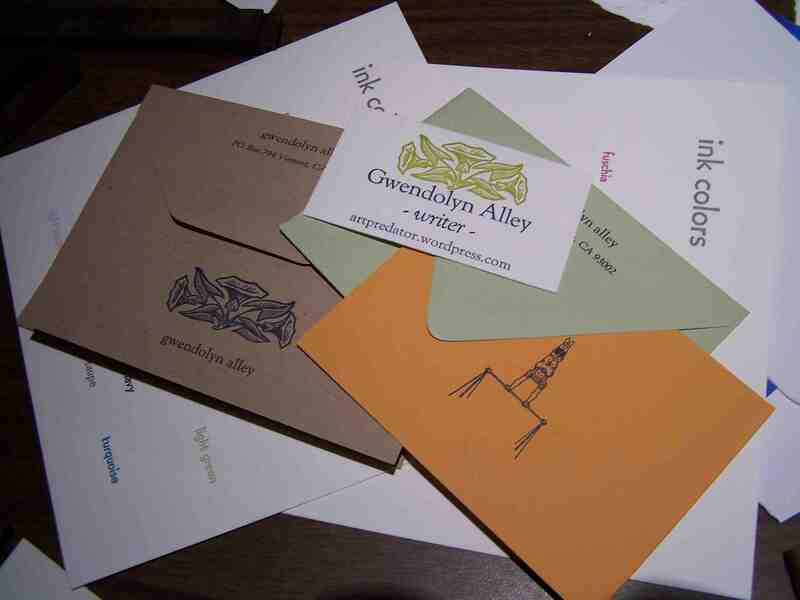 After we made the cards, we moved into doing some stationary using the already set type, graphics, and cobalt blue ink. We made three kinds of cards and two envelopes with my return address. There is so much to like about Lettre Sauvage and how they function as a business. One of their key considerations in making decisions is factoring in the impact on the earth. The paper for the business cards is 100% recycled cotton, for example, and the papers here all use recycled content. It was a long day, with lots of decisions to make, and much of it spent on my feet on the concrete floor since I was too active and excited to sit down! I am thrilled with the results and couldn’t be happier with the service and expertise which Fiona and Cameron offer at Lettre Sauvage. Of course, you don’t have to be as intimately involved in the process as I chose to be; they get most of their business over the web, and can design and print your project for you. I’m a hands-on person and really enjoyed being there and being involved. They can include you as much as you desire over the miraculous internet. It’s not cheap to makes cards this way–what I have though is really special, distinct, and unique. Thanks again, Fiona and Cameron! (and for sending over the photos too!) And thanks, Dave, for your help and your company! Cool, the hands on way connects you to the product, adds energy in am mystical fashion. Datura is a wild but you have to be super careful cos permanent blindness can result, the visions can be worth the risks though. Your cards are going straight into my sample book to bring to SF this weekend. Top notch work. Others will be inspired to roll up their sleeves! I looked at a few videos on youtube about jimson weed or “moon flower” as it is called…whoa…heavy trauma for some people who’ve made it into tea! One guy made a video saying he’d been trippin’ for two months. It sure looks nice in chartreuse ink! I really want to experience the Fiona/Cameron letterpress experience. I’ve been foiled at previous attempts. And I’ve loved the evolution on their mechanics! Damnit. I need to quit procrastination. I need to attend the ideas I love. Fiona, glad you are as pleased with them as I am! I checked out some youtubes also looking for one which shows the flowers opening in the evening and saw a few of those which depict the trauma experienced by people who have taken datura. Not something to mess with! There are so many substances with hallucingens–did you know you can get high on nutmeg and die from ingesting 2?